Re: Descramble It! Pixel Puzzle! Can you post the 100% correct image so we can see it? Fixed mine, I think now it's 100% correct. ter-o: ptoing has it right now. ptoing: Yes, it's perfect down to last pixel. 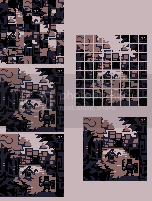 This is my best attempt, but I'm really not sure about the bottom row of tiles: like this? yep, close enough. Those things at the bottom were supposed to be round bubbles. I think I've fixed the bubbles now. Hey, while I remember, do you have the solution to your scrambled image for the descrable it thing? A month ago my computer dies, takes with it the only copy I kept of the solution. That same week, ilkke comes and he asks me if I can send it to him. I say, you know what? I made this puzzle, I can put it back together. So I gave it a go, and spent hours doing it, and in the end it turns out even I couldn't do it, not exactly. So I really am sorry about how broken it was. Again, I 'm really sorry about this whole damn thing.